So that's it for our first live text commentary of the day. Our next one will be live at 16:00 BST, so quickly grab some food and we will be back shortly for the Scotland and Republic of Ireland matches. So that's three games for Dunga in his second spell in charge of Brazil. Three games, three wins, four goals scored, no goals conceded. Crisis? What crisis? Kenneth Ayozie: I must say Neymar was the better captain today. Don't forget this match is the first of a busy day of football on the BBC Sport website. Later on we will have a live text commentary from Scotland and Republic of Ireland's Euro 2016 qualifiers against Georgia and Gibraltar respectively (both kick-off at 17:00 BST), before our attention turns to Northern Ireland's match against Faroe Islands at 19:45 BST. Both teams have one more match to play during this international break. Brazil play against Japan on Tuesday in Singapore (11:45 BST) with Argentina playing against Hong Kong (13:00 BST). Sixteen shots from Argentina, but three quarters of them going off target. Some shooting practice might be needed in training for the World Cup runners-up. And that's it. Brazil secure a 2-0 victory against bitter rivals Argentina in Beijing. Two goals from Diego Tardelli prove the difference, although Argentina, who started brightly, disappointed and offered little after Lionel Messi missed a penalty at the end of the first half. Both goals conceded were poor defensively, but Brazil will have gained a much-needed confidence boost after their World Cup exploits. A late chance for Lionel Messi to give the Chinese fans a chance to see his free-kick skills. The ball is central and 35 yards out. The effort is more powerful than his last attempt, but off target and narrowly goes wide. More than 50,000 fans are in the Bird's Nest Stadium in Beijing. The game was brought to China in an attempt to boost football in the country. The fans have certainly seen a passionate, exciting and hard-fought encounter between two of the sport's superpowers. For all of his defensive flaws, David Luiz can certainly strike a free-kick. The Paris St-Germain defender blasts an effort at goal from 30 yards and Sergio Romero is very happy to be able to fall on to the ball to keep it out of the net. Kaka, World Footballer of the Year in 2007 and part of the World Cup winning side of 2002 is back in action in a Brazil shirt for the first time since March 2013. The 32-year-old comes on in place of two-goal potential match-winner Diego Tardelli. Adam Palmer: The way the players are arguing with the ref and getting right in his face intimidating him is disgraceful. Dominic O'Caollaí: The way the Brazil players have been bullying the ref after decisions is an absolute disgrace. Should all be punished. Those smiles nearly got wider. Neymar is played through and with Sergio Romero off his line, Neymar tries to lob the ball over the goalkeeper but the forward gets too much on it and the ball lands on the roof of the net. Lionel Messi's free-kick is curled over the top of a jumping Brazilian wall and forces Jefferson to push the ball wide for a corner. But the set piece is then wasted. Brazilian fans may never forget their 7-1 humbling by Germany, but at least their fans can have a smile on their face if the scoreline remains the same. Diego Tardelli could have had a hat-trick. He closes down Sergio Romero and the goalkeeper fires his clearance against the 29-year-old striker, but, luckily for Romero, the ball rebounds over the crossbar. Argentina enjoyed a fantastic 25 minutes, but have been second best since brazil went ahead midway through the first half. Some of you are less than impressed with Neymar making a lot of some pretty tasty challenges. He has been repeatedly fouled during the second half, but some people think he should toughen up. Stephen Cleaver: Brazil have just scored their second goal and during their celebrations Neymar went to ground and asked for a free kick, priceless. Jay: If Neymar was paid £1 for every roll on the ground, he'd be earning more than Ronaldo & Messi combined. We haven't seen much of Lionel Messi since his penalty miss at the end of the first half. But he has a shot on target, although his 25-yard daisy-cutter is easily dealt with by Jefferson. Brazil double their lead. And again it is horrible defending from Argentina. A corner from the left is aimed towards David Luiz at the near post, the ex-Chelsea man cannot get a touch to it and the ball falls to Diego Tardelli, who has peeled off his marker and is unmarked six yards out. His powerful header is at Sergio Romero, but the Argentina goalkeeper can only palm the ball into the roof of his net. Brazil lead 2-0. Tardelli, who had failed to score in his previous seven international appearances, has both goals. Barcelona manager Luis Enrique must be hiding behind a cushion watching this on television as every time Neymar gets the ball it always ends in a painful-looking cynical challenge. This time Manchester City's Martin Demichelis is the man responsible. The ball is just outside the penalty area, not far from the left touchline. And Oscar nearly makes Argentina pay for their persistent fouling. His free-kick finds a way through, but Argentina goalkeeper Sergio Romero does well to parry the ball to safety. Once again Neymar is fouled. A free-kick is then floated to the back post and it finds David Luiz. But the former Chelsea man chooses the wrong option. Instead of squaring the ball across the six-yard box, where three of his team-mates were waiting, Luiz goes for goal and fires wide. A chance for Angel Di Maria to make it 1-1. He bursts through the Brazil back line but the ball gets stuck underneath his feet and that gives the Brazilian defence the opportunity to get back in time and take any power out of the shot. Neymar will certainly know he has been in a game. Only three minutes after an early second-half reducer from Javier Mascherano, Federico Fernandez is the latest player to flatten the Barcelona front man. Swansea's Fernandez, who was involved in the defensive mix-up that led to Brazil's goal is the next man to be cautioned. Earlier on Saturday, Radamel Falcao, pictured above right, scored for Colombia as they beat El Salvador 3-0 in a friendly. The Manchester United striker opened the scoring in the eighth minute, before Sevilla's Carlos Bacca grabbed a brace to complete the win. In other games, West Ham's Enner Valenica struck late on to rescue a 1-1 draw for Ecuador against the United States, who had led through Mikkel Diskerud's early goal, while QPR's Eduardo Vargas scored twice as Chile beat Peru 3-0. Inter's Gary Medel grabbed the other goals for the hosts. Get back in defence Filipe Luis. The Chelsea full-back finds himself in the centre-forward position after an intelligent through pass from Neymar. But Luis is no Brazilian number 10. He shoots wildly, loosely, miles over the top when clear with only the goalkeeper to beat. He retreats back into defence looking a bit sheepish. In today's Football Focus, we asked whether England should play some of their home matches away from Wembley. The results are in, with 74.8% of you saying the Three Lions should do exactly that and visit other venues around the country. Many players have felt Javier Mascherano's studs on their knee during the Argentine enforcer's career. Neymar is the latest to suffer as he is the victim of a poor challenge near the touchline. But the free-kick is wasted. Neymar is OK to continue and Mascherano is lucky to get away with that one. Argentina dominated possession in the first half, had more shots and hit the target more than Brazil - yet still they trail. The teams are back out on the pitch in Beijing. Can Argentina get themselves back into this one? Don't go anywhere. We will soon find out. Here we go. No changes from either side at half-time. It is a big day of international football in the Euro 2016 qualifiers for Scotland, Republic of Ireland and Northern Ireland as they are all in action later on today. We will have live text commentary for those games this afternoon. Justin Kee Son: Some of those Brazil players are a disgrace for pushing and handling the ref like that (after the penalty was awarded). Justin Lee: Brazil vs Argentina international ''friendly''. Players are playing as though it's the World Cup final. So Brazil go in at half-time with the lead. Argentina made a bright start but could not capitalise on their possession with Angel Di Maria firing over from just outside the penalty area on two occasions. 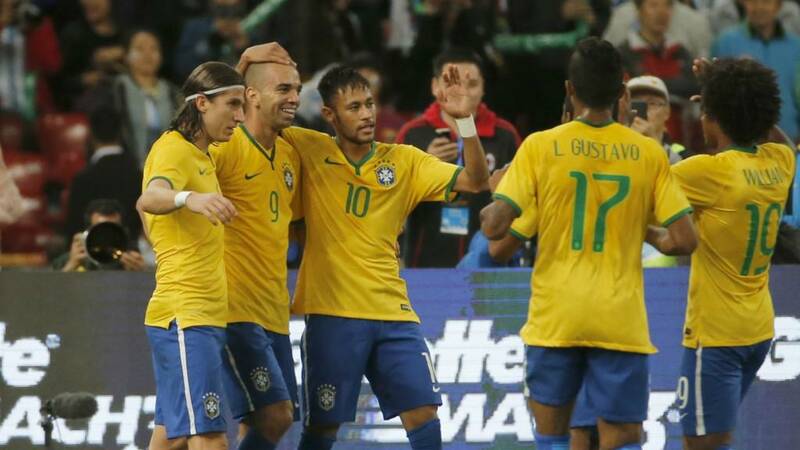 Brazil went ahead against the run of play, with Diego Tardelli's well-controlled volley. Argentina, who should have had an early penalty when Sergio Aguero was fouled, are awarded a late spot-kick but Lionel Messi's effort is saved by Brazilian goalkeeper Jefferson. Arguably the best player in world football, but that's a pretty awful penalty. Lionel Messi's spot-kick is weak and not in the corner. It gives Jefferson a chance to be the hero and that's what he becomes. The Brazil goalkeeper pushes the ball away, another chance then falls to Messi and he shoots wide, but the assistant's flag was up for the second opportunity anyway. Neymar is showing once again just how important he is to this Brazil side. He missed the 7-1 mauling by Germany through injury and he has been his team's star player once again. Another fine piece of skill sees him go past two Argentina defenders but his shot on goal is blocked by Javier Mascherano. A magical run from Neymar sees the Brazil forward ease through the Argentina defence. However, good goalkeeping from Sergio Romero keeps the score at 1-0. The keeper stands up for as long as possible and Neymar tries to take the ball around him, but gets things wrong with the ball harmlessly dribbling out of play for a goal kick. Brazil's number nine Diego Tardelli has been banging the goals in for his club Atletico Mineiro, boasting a total of 34 goals in 92 appearances for the Brazilian side. He is off the mark now for his country. Brazil take the lead against the run of play. And it is because of horrible, messy defending from Argentina. A ball is played into the Argentina penalty area from the right by Oscar and Pablo Zabaleta and Federico Fernandez get in each other's way. Fernandez heads the ball out to Diego Tardelli and the Atletico Mineiro forward scores his first international goal with a well-struck volley past Sergio Romero. Football Focus is starting now on BBC One and at the top of this page. here. The results will be available on this page later today and announced in the programme. Muhammed Owais: This is the difference between Brazil and Argentina. Aguero denied clear penalty while Neymar dives and gets easy penalties. Soccer Pundit: Brazil have got to give their fans a good result today. Most especially to calm that 7-1 trashing by Germany in the World Cup. They're getting closer. Lionel Messi is given space to run at the Brazil defence and he slides a pass through to Sergio Aguero, but the Manchester City man cannot keep his shot down as another chance is wasted. Brazil have yet to get involved in this game. Lionel Messi has had a free-kick deflected wide for Argentina and Angel Di Maria is yet to find his range, shooting over the bar from 30 yards after linking up with Tottenham's Erik Lamela. The Brazilians have already been guilty of a number of crunching challenges. Especially David Luiz, who wiped out debutant Roberto Pereyran that leaves the Argentine rolling on the floor. Welcome to international football, Roberto. rarely play their matches on home soil. Argentina should have a penalty. And it's that man Sergio Aguero causing the problems. A weaving run into the penalty area is brought to a halt by a clumsy challenge from full-back Miranda. But the referee is not interested and waves play on. Vote - Should England go on the road? Brazil struggled defensively during the World Cup and they don't appear to have tightened up too much at the back. In the opening 15 seconds, a wonderful piece of control from Sergio Aguero, to take a ball over the top, gives the Argentine a chance. Luckily for Brazil, the much-maligned David Luiz recovers in time to force the shot wide. Angel Di Maria then fires one over the top from 25 yards. Brazil already looking fragile. Stuie Neale: Not sure why this is being played in China but Argentina to edge it 3-2. John McEnerney: Great to see Kaka back in the fold, shame his time at Real Madrid didn't work out, top quality. Robinho is a passenger, overrated big time. Fahad Khan: Oscar versus Di Maria. That is the place to look at. That is where all the goals will come from. The players are out on the field and the national anthems are soon to be played. players were stuck in their hotels after authorities issued an orange pollution alert - the second highest level with air quality 18 times worse than the recognised safety level. "One of the pieces of advice that those responsible for pollution control give is that people should stay indoors and this is what we have done," said Rodrigo Lasmar, Brazil's team doctor. "Our athletes stay inside the hotel and only go out for training. Out of every 24 hours, they spend 22 inside the hotel." Will this cause the problems later in the match. We will soon see. We mentioned the game was taking place in China. There are going to be some tired players at Manchester City, Chelsea and Manchester United next week. So what has happened to Brazil since 8 July? Well, they've gone back in time, that's what. Manager Luiz Felipe Scolari resigned after the World Cup campaign, which ended with another embarrassing defeat, this time 3-0 against Netherlands in the third-fourth play-off. Since then, Dunga, who was in charge from 2006-2010, is back at the helm and guided them to 1-0 friendly wins over Colombia and Ecuador. Ex-Manchester City forward Robinho is back in favour and playmaker Kaka, World Footballer of the Year in 2007, is in Brazil's squad and could play for the first time since early 2013. But he is not starting. He has to make do with a place on the bench. So as always we want your thoughts on this match? Who is going to win, what are the key battles and what do you expect? Also, what do you make of the decision to hold the game in China? We have mentioned that Brazil fans may never forget their 7-1 thrashing at the hands of Germany. What is your side's worst defeat? Does it still hurt? If so, why? Argentina opt for a potent strikeforce of Lionel Messi and Sergio Aguero. Manchester United's Angel Di Maria and Marcos Rojo are included, as are Aguero's Manchester City team-mates Pablo Zabaleta and Martin Demichelis. Argentina XI: Romero; Zabaleta, Fernandez, Demichelis, Rojo; Pereyra, Mascherano; Lamela, Di María; Aguero, Messi. Neymar starts up front for Brazil, while Chelsea trio Filipe Luis, Willian and Oscar are also named in Dunga's starting line-up. Brazil XI: Jefferson, Danilo, Miranda, David Luiz, Filipe Luis, Elias, Luiz Gustavo, Willian, Oscar, Diego Tardelli, Neymar. Hello, hola, ola, thank you for joining us and welcome to BBC Sport's live text commentary for Argentina v Brazil. But today's Superclasico de las Americas is not taking place in Rio de Janeiro or Buenos Aires, nope, the players have gone on their travels and ended up in Beijing, China. The Bird's Nest stadium may look familiar to you. This was the setting where Usain Bolt won his first Olympic gold medal with victory in the 100m six years ago in the Beijing Olympics. Across the city, Argentina collected gold in the football. They beat Brazil 3-0 in the semi-final, although the Selecao won the bronze medal match. Ninety-five days later and the scoreline still amazes. On Tuesday, 8 July, expectant Brazil fans were hoping to see their side beat Germany in the World Cup semi-final on their way to winning the tournament for the first time on home soil. That was the dream. The reality became an unbelievable nightmare, one that will always haunt Brazilian football. Five down after 29 minutes, seven behind after 79. Brazil 1, Germany 7 (seven). Outplayed. Embarrassed. Humiliated. Today, Brazil can start to feel good about their football again. Today they have the chance to beat their neighbours and fiercest rivals. Games in world football do not get any more passionate than Brazil v Argentina. Neymar v Messi. This is going to be good.